My name is Brenda Scott and I am a retired Perioperative Registered Nurse. I enjoyed a very long nursing career and worked full time for 34+ years at our local community hospital. Working in the operating room meant many hours of "on call" and many hours of overtime in addition to my regular hours, but it was a challenging and rewarding career and I would not change anything about it. My husband retired in 2006 and I retired in 2008 and we have loved the new found freedom that retirement has given to us. During our working years my husband and I also raised two children. Both are grown now and have left the nest and we have a delightful two year old grandson. We are very blessed. I've always loved dolls, especially tiny baby dolls for as long as I can remember. In fact I still have 4 of my favorite ones. This passion has been shared with both my mother and sister who both love and collect dolls. My sister designs knitting patterns for my small babies and my mother brings them to life with her knitting needles and crochet hook. I would like to also give credit and a special thank you to my talented friends on eBay & Facebook who have also created some of the beautiful outfits seen in some of these pictures. Years ago my mother and I took a weekly class of porcelain doll making with a wonderful and talented lady named Stella. 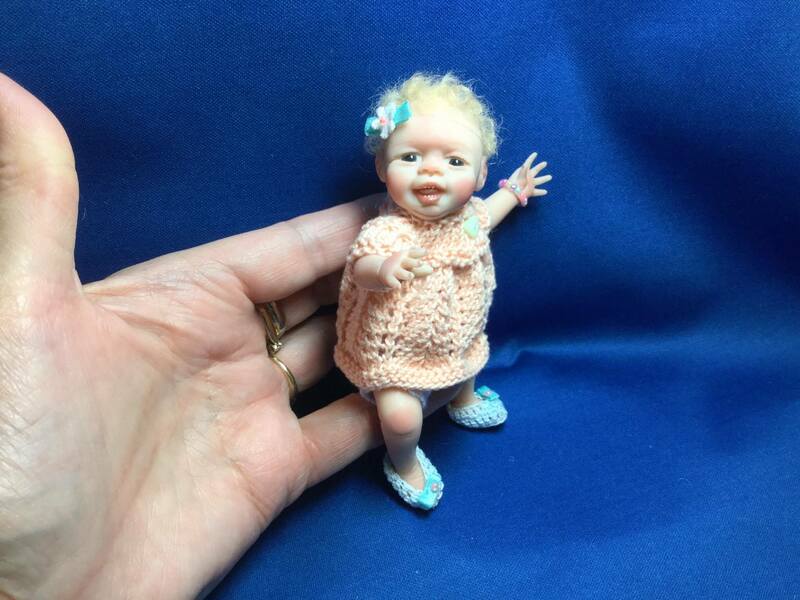 Although I enjoyed that type of doll making I always longed to sculpt my own doll and many times had said to my mother "Someday I am going to sculpt my own doll." My quest to sculpt a doll began after retiring when I stumbled upon the MacPhersons Arts and Crafts website in St. Mary's, Ontario. When I was viewing their online site I noticed they had a one day class for sculpting a 6 inch one-of-a-kind (OOAK) baby. I told family and they surprised me with a gift certificate for the class and thus the journey began. The class was taught by Dawn McLeod and when I finished that day and took home my very first sculpted baby I was hooked! I continued to practice, watch tutorials on YouTube, etc, trying to get all the info I could to improve my work. Later I took another class at MacPhersons Arts and Crafts in St. Mary's with Dorothy Stevens.These two talented and wonderful artists were always so helpful during and after the classes that I would like to extend a thank you to both of them. They helped me immensely with not only information but with lots of encouragement.